Marketing attribution has been a hot topic for marketers as long as we’ve had marketing. Everybody talks about it, few really know how to do it, and everyone thinks everyone else is doing it – so everyone claims they’re doing it. This may be different where you are, but what I’ve seen here in Europe is that many folks are not aware of the full potential of marketing attribution modeling. They don’t know which types there are, if it’s only online or offline data, and all the other permutations and nuances. So let me see if I can sort it out for you. Why is marketing attribution important? During any given purchase journey, a customer engages with different marketing channels, such as catalog, email, website, contact center and so on. When he finally is comfortable to place an order and the sale is made, all the marketers that touched that sale wants to claim responsibility. And why not? The web team will cite the great web design, the direct marketing team will trumpet the beautifully crafted email, the contact center has their transcripts to document the interactions, and so on. And the truth is that they probably all had an impact. But in order to make fact-based informed decisions for future strategy, knowing the value of all the marketing efforts is key. How do you value your marketing efforts? I’d like to highlight two well-known approaches to value your marketing efforts: the bottom up approach and top down approach. Bottom up is mainly behavior driven, it will attribute the sales based on the marketing touch points that were used during the customer journey. While the top down approach is based on Sales/ROI lift analysis, it will show you what the uplift in sales is when you invest more in a specific channel for next month. I lined up 3 key differentiators in the table on the right. The bottom up approach comes from the digital marketing world. It will look at each customer journey individually and award each marketing touch point with a percentage of the sales generated by that customer journey. 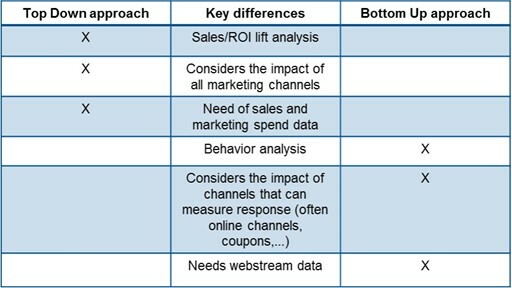 There are two main ways to do the attribution for each marketing channel. 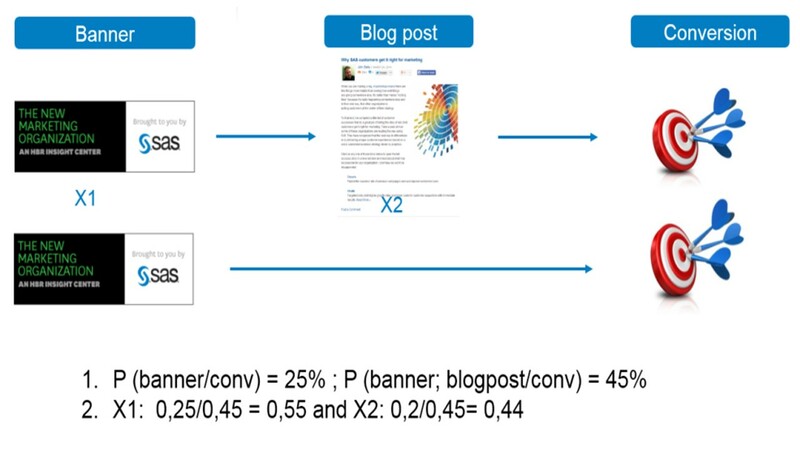 The contribution of the blog post after seeing the banner is 45% – 25 % = 20%. Using the algorithmic approach you will gain more insights into key drivers of the customer journey, such as how it is different for each of the relevant segments, what drives conversion for new customers and existing customers, which banners are often used, and how you can reduce time to conversion. The bottom up approach has a few drawbacks because it doesn’t take into account any carry-over effects of previous marketing spend, or broader environmental factors (i.e. weather or GDP). It also doesn’t tell you how you need to allocate your marketing budget for next month, or show the immediate relationship between marketing spend and sales. Also, you still need to track your customer through all applicable marketing touch points, such as customer web stream data. For those reasons, the bottom up approach is often used in combination with a top down approach. The top down approach is used to analyze the return on investment of your marketing spend in relation to your sales. This is accomplished by using an econometric or time-series model that includes marketing spend, economic factors and competitive factors. When done right you will gain many insights into which marketing channels are working and how you should further allocate your marketing budgets. On the surface, econometric modeling may seem difficult to grasp, so simplifying the problem may make it more accessible. Let’s give it a try. To be able to calculate the uplift in sales we need to calculate the impact of each channel here described by beta. Rather than a typical multichannel scenario as depicted above, let’s assume that we only have one marketing channel (catalog), and that currently we aren’t investing any marketing budget, so then sales equals zero (big surprise). 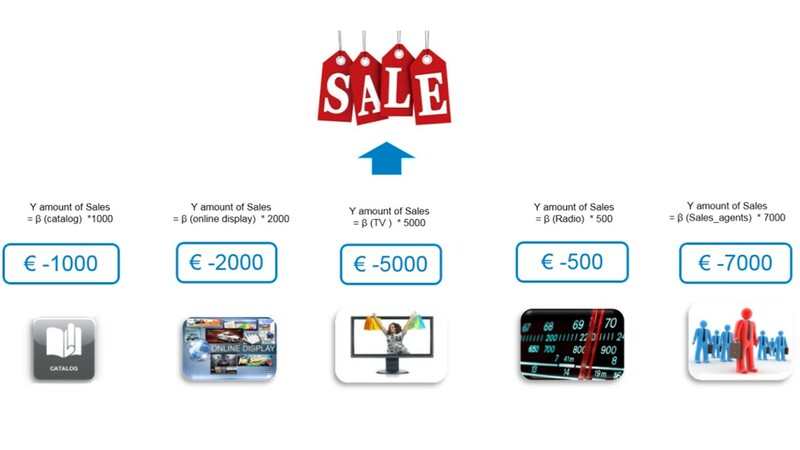 The next month, I’ll invest 1000 € in the catalog channels, and the sales result ends up at 10,000 €. This is a simple equation which results in a weight factor of 10. So for every Euro invested in catalogs I will get 10 Euros in return. Not bad, eh? Well, the real world is unfortunately not that simple, and it’s usually not even as simple as that five-channel scenario in the figure above. It’s by having a different set of marketing investments each month that you will be able to calculate the ROI of each marketing channel in combination with good predictors that describe the economic impact on sales and competitive spend. The top down approach also takes into account previous marketing spend, which is good because usually previous marketing spend also has an effect on future marketing spend. It allows you to create different scenarios for your marketing spend. It will reveal aspects of the relationship between sales and marketing spend. It will give insights concerning cannibalization and halo effects across different brands, themes or products. You can see the influence of competitor spend on your sales. Marketing mix modeling is often referred to as a top-down approach for it’s a more broad-level view of channel influences and interactions. You don’t need granular customer level data, marketing spend and sales are often available within organizations. The top down approach has also a disadvantage. It remains a high level overview. You don’t know which banners are performing well, what exactly drives conversions, etc. That’s why often the best of both worlds are used, meaning top down is used to set the budget for each marketing channel and bottom up is used afterwards to see which content, key words etc. drive sales.